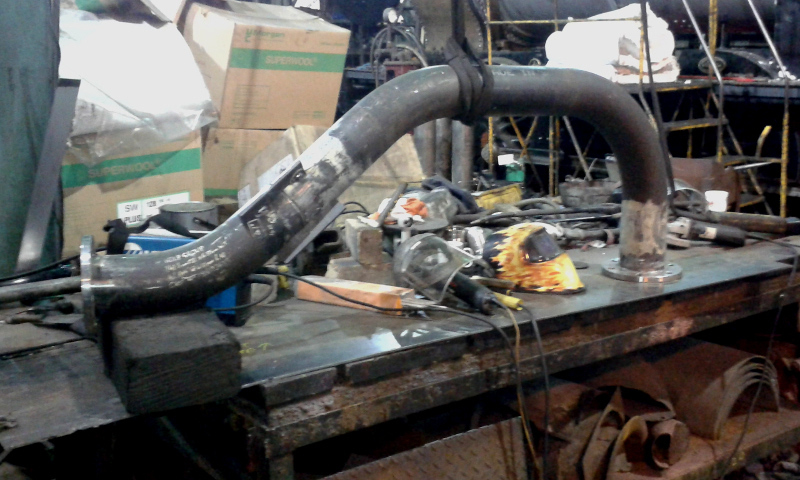 With Mark O'Brien's return from paternity leave yesterday, he checked over the trial fitting of the steam pipe, and once satisfied, removed it and it is now on a jig in the Fabrication Shop ready to be welded up (see photo). Once that has been completed (hopefully today), it will then have to be NDT'd before being refitted and hydraulic'd. The blast pipe (whose alignment will need some adjustment) and chimney will then follow (the hole for the chimney has already been cut) and a steam test carried out to make sure the assembly is steam tight, before the smokebox base is concreted. The smokebox door has also been fitted but the brackets need adjusting to ensure a tight fit all round. The buffers have been removed to be re-tensioned. The two firebox cladding sheets are now fitted and strapped. 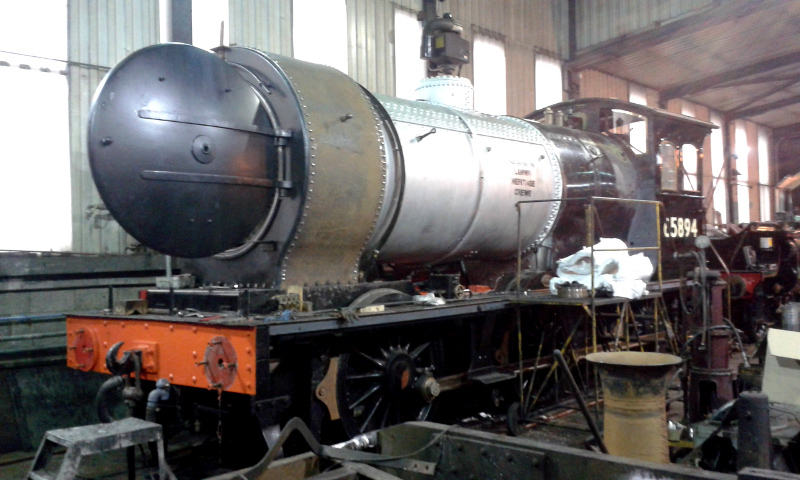 A new longitudinal crinoline strip for the bottom of the boiler was being made yesterday, following which the rest of the cladding will be fitted. The brass ring at the back of the smokebox has been put on but just left loose until the rest of the cladding has been fitted. Two new sheets will be need to be made to go round the corners of the firebox under the boiler, as the originals cannot be found. 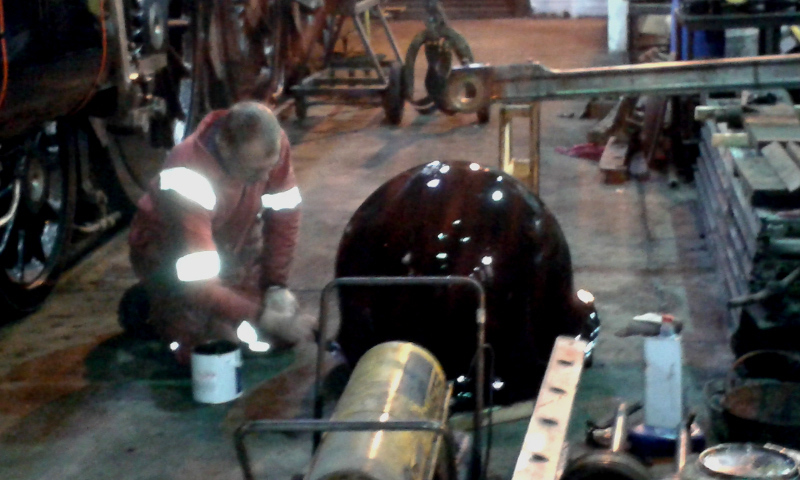 John Furness gave the dome a coat of gloss paint last night (see photo). Following a visit by Nick Raisby last week, the grate is now in, but has had to be adjusted as the rocker only worked one way, and the damper door is not working properly so the ashpan sprays may also need adjusting. The brick arch can go in any time. In the cab, the sliding windows are now installed, along with the cab seats, although some damage was done to the outside of the right hand cab side in fitting the latter: that has now been rectified by John Furness. The cab floor is due to be brought down from Deviation Shed, and a check is to be made with LNWR Crewe to see if they have the whistle linkage. If not, a replacement will have to be made. Once the bottom of the new smokebox wrapper has been prepared and painted, the sandboxes can be attached and the locomotive will then be ready to be moved to the pit in the Running Shed, where access underneath for final checks of pins and cotters etc will be much easier. A general photo of the locomotive yesterday is attached. John Furness would be delighted if any volunteers were available on Saturday to prep the bottom of both sides of the smokebox wrapper for him. They will need needle gunning to remove the mill scale and then wire brushing to get the rust off and restore bright metal. He has emphasised though to only work on the bare new wrapper and not touch any of the already painted areas, and not to apply any paint - that will be for him to do. As there will be a Q6 working party this Saturday, any volunteers coming for this work should report first to Ian Pearson or Bill Dobson in Deviation Shed to record their presence on site, and collect the necessary tools and instructions for the work. On those occasions when volunteers attend to work on the J27 and there is no Q6 working party, can they please make sure they report to the MPD Office or Duty Fitter for the same purposes.